With 'JioNet' high speed Wi-Fi, watching Test Match at Uppal Stadium just got better! Hyderabad, 10th February 2017: It was a double delight for spectators at the Rajiv Gandhi International cricket Stadium, Uppal on Friday. 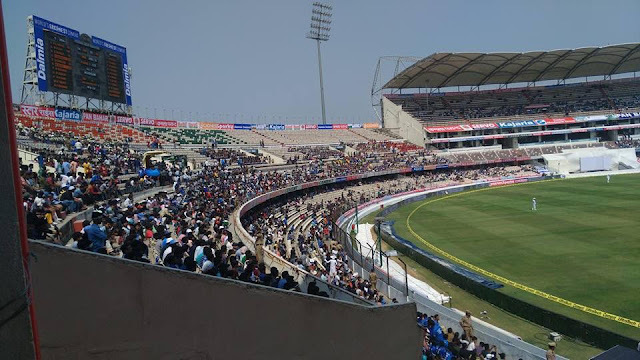 Besides witnessing the enchanting double hundred from Indian skipper Virat Kohli, and Cricketing heroes live, spectators had the privilege of browsing the net and share their selfies with friends and dear ones live as Jionet High Speed Wi-Fi was made available across the Rajiv Gandhi International Stadium. Reliance Jio, which has covered entire stadium with its JioNet WiFi during the last IPL season, is offering this high speed internet service for the ongoing India-Bangladesh historic Test Match till 13th February. To avail this service, all that is required from the spectators is a smartphone. A redirection to the Jionet homepage after connecting the Wi-Fi on one’s smartphone asks for one’s mobile number. The insertion of the OTP and you are connected! With the Indian team piling up huge runs on the score board, it was a field day with the secure JioNet’s comprehensive coverage of high-speed (speeds ranging between 20-30 mbps) internet at the Uppal stadium. Smart mobiles got a new lease of life with the Jionet Wi-Fi, helping the confused with facts and figures of their cricketing stars. With the Wi-Fi providing unbelievable download speeds, their cricketing experience just got doubled.